How well the lines of the fanciful poet fit this picture, The Charm of Music by the young Chinese master, Yun Gee. Seated before us is the painter. He is plucking the strings of a “yungkum,” (Chinese mandolin), with a bamboo shoot. Beside him are his only friends, a cat, a dog, a monkey and some frogs. He is dressed in a blue robe; symbol of abstract beauty, and surrounding him is a mellow haze of ochre, symbol of harmony. When I was young, I made a craft of my curiosity and sailed out upon the sea of human happenings. I sailed until I reached the portals of the dawn and found that the sun, whose light I had followed, was long since dead. So I returned a man, and wandered through desert lands, finding many Gods and many saints, but though I saw their shadows grow to the heavens, I could not discern their substance on earth. Now I have returned to the solitude of my own cell and content myself to play a melody of longing upon my instrument. And the music, whose notes are visions sent by God, opens the eyes of my soul so that I see what I vainly sought for throughout my wanderings. From a technical standpoint, the composition is a subtle balance of mass and color, where in the relationships between the tonal and tactile weights of the various objects are perfectly juxtaposed. There is a harmonious and unbroken flow of lines, coupled with an exquisite coordination of the various parts to the whole, which shows Yun to be a master of design. The work has combined within in the vitality of European art and a distinctive flavor intrinsically Asiatic. The naïve unconsciousness of the mood expressed in this painting is its greatest charm. The Chinese painter, according to Roger Fry, the eminent critic, “has not that special human arrogance of the European artist and, therefore, retains much of that peculiar intimacy with animal life. They understand the life of animals from within and by a sympathetic intuition, not by an external and merely curious observation.” Yun Gee, in his representation of his animal friends, has borne out the critic’s remarks with astounding success. The mood of this fantasy is a sustained note of calm reflection and the entire scheme of congregated forms could well be compared to a soul-soothing strain played on a violin. The sense of music pervades and is felt – almost heard – the more one steeps oneself into the spirit of this painting. The relationship between the arts considered so harmful by the western mind, the literary qualities that exist in this work is in keeping with the purposes of art from the Chinese viewpoint. 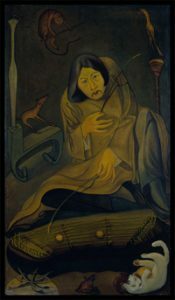 “All art must serve the nature of man,” says the greatest of Chinese painters, Koo Hai Cho, “and the artist, whether painter or poet, musician or sculptor, must teach his disciples the art of arts – spiritual significance.” Unconsciously, Yun has followed the precept of his ancient predecessor. Through a pictorial vehicle he has delivered himself of a musical concept. The painting is, in the fullest sense, a “catharsis” – a purgation – in which the artist has given expression to a feeling and rid himself of his emotion. In contrast to the expressionist painting of the western school, however, this work does not convey to the onlooker a series of disturbing sensations, but on the contrary, a supreme manifestation of serenity. As we look at this painting of the youthful Chinese, Yun Gee, we can discern the challenge of the east to modern art: “You claim that unhampered expression is the secret of great art. How can it be, when such significant emotions as these can result from an ordered repression and impersonal restraint?